Many months ago, we brought Viveltre to your attention. The gourmet marshmallow Kickstarter offered 17 exciting flavors, and it obviously got funded, because it's hard to say no to bacon-bourbon 'mallows. Now, they're looking to take this marshmallow revolution even further with a new line of 7-Layer S'mores that may change camping as we know it. Caramel Blonde packs Biscoff cookies, milk chocolate cream, caramel blondie marshmallows, Madagascar vanilla marshmallows, and salted caramel macadamia clusters into one stuffed Mason jar. Hazelnut Dreams boasts Viveltre's Nutella marshmallows, plus the Madagascar vanilla ones, in between layers of almond biscotti and chocolate hazelnut cream, with toasted hazelnuts and more Nutella on top. Bacon Bourbon stars perhaps the most exciting marshmallow -- the kind with candied bacon -- alongside crushed pretzels, bittersweet chocolate cream, and a top layer of Maker's Mark-infused marshmallows. You can also add an optional natural hickory wood smoke, to give the thing more authenticity. Chocolate Seduction is Belgian chocolate 'mallows mashed against chocolate chip brownie crisps, dark chocolate cream, more Madagascar vanilla marshmallows, and chocolatey cherries and almonds. Apply only if you keep Godiva locked in a secret drawer in your desk. Viveltre met their initial goal just five hours after they launched the new Kickstarter, which means their first flex flavor, Mint Temptation, has already been unlocked. But you can still chip in to get the Double Chocolate Fleur De Sel Pistachios S'mores and Femme Fatale S'mores Cake out into the world. 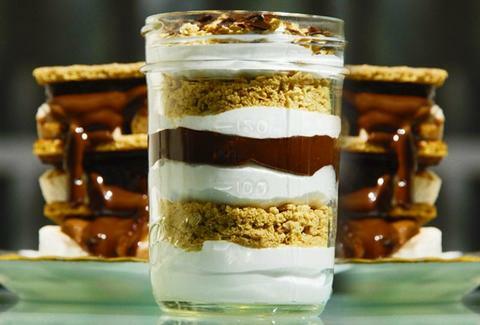 Future s'mores junkies will thank you. Kristin Hunt is a Food/Drink staff writer for Thrillist, and plans to clear her pantry immediately so she can line it with these. Follow her at @kristin_hunt.